We make our return trip through Amsterdam early on Sunday morning, a good choice as it was quiet and relatively free of traffic. Seems the Dutch still take Sundays seriously, at least in the morning - when we reach Weesp the streets and cafes stay empty until the afternoon. 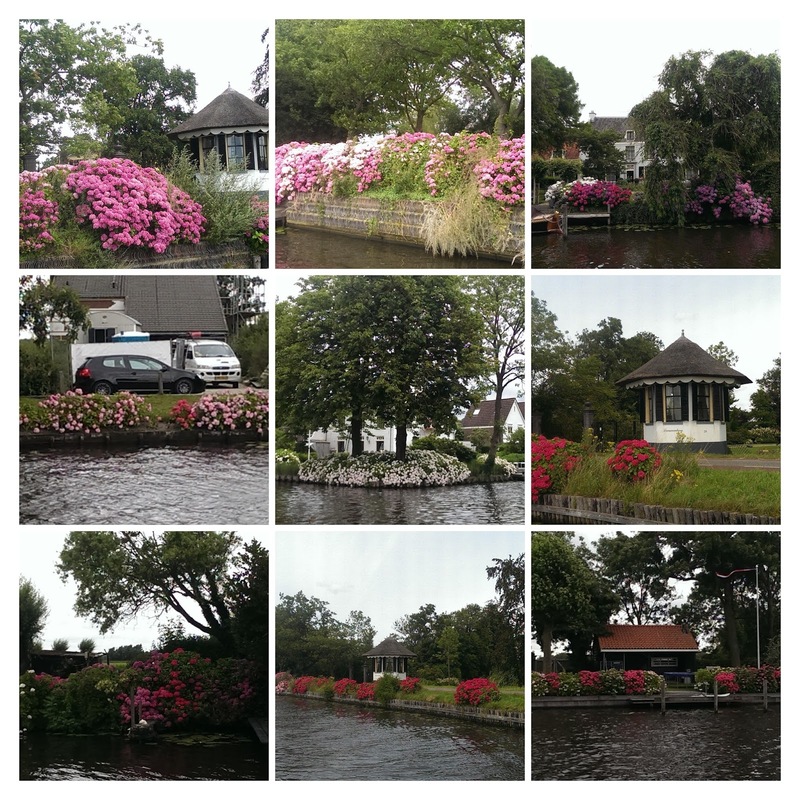 From Weesp our itinerary is Sunday night in a countryside stop, 2 nights in the charming small town of Breukelen, after which our penichette is named, 2 nights in Utrecht, then Friday night back in the base at Loosdrecht, ready to give the boat back on Saturday morning. seeing a bunch of Dutch teenagers returning from a sailing and camping weekend in small steel-hulled yachts, 4-5m. They are gaff-rigged, with masts that can be dropped. When we first see them they are being towed, daisy-chained behind a motor boat, then we watch enviously as the kids use a single long oar to scull them expertly into their mooring spots, alongside us. Breukelen, where we have a lovely country walk, then a bit of a rest day because it is raining, and find two restaurants where we have very good food. Speelklok Museum in Utrecht, filled with every imaginable mechanical music making device, from huge fairground organs to tiny music boxes, from Nickelodeons with circular metal disks to a Steinway player piano. Most amazing is a mechanical violin, extraordinarily ingenious construction involving 3 instruments each with only one string, and a circular bow rotating round all three. There is also a "woven music" display where a punched cardboard music "book" has been turned into cards for a Jacquard loom, then used to weave a scarf. We stay until museum closes, fascinated. getting back to the Locoboat base and finding that they are very nice about the minor damage we did by clipping another boat in a very tricky un-mooring situation, and that the cost is covered by insurance in the "inclusive package". 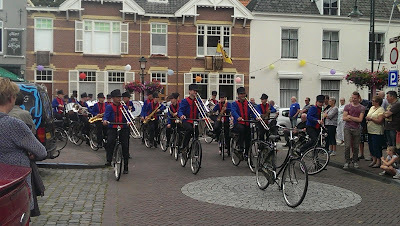 another serendipitous happening when we decide to break our trip from Holland back to France in a little village called Tholen, which just happens to be celebrating its 650th anniversary. And to Peter's delight, the town also has a working windmill. To see the windmill in motion and the amazing parade, click here. Dutch must start using both as soon as they can walk. Boats of all sizes skilfully manoeuvred everywhere. Bicycles ridden rapidly and vigorously in all weathers by people of all ages, some looking quite a bit older than us. Cycles range from rusty black treadlies to more modern numbers, but still mostly black. No one seems to bother with gears, it's so flat. They can and do dodge anything at a moment's notice, from other bikes to hapless tourists looking the wrong way when crossing roads. They often ride one-handed with the other hand used for a variety of purposes: talking on mobile, smoking, eating an ice-cream, nursing a child, holding a shopping bag, holding hands with another cyclist. 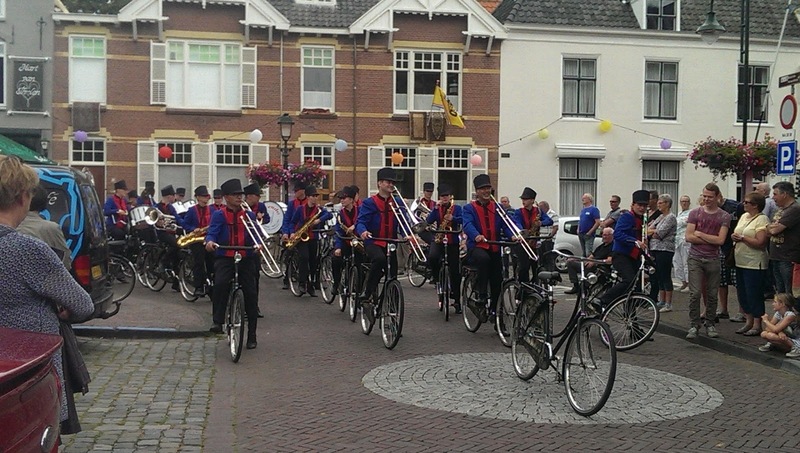 The ultimate was an entire brass band playing while cycling. In the height of summer, so everything is in full bloom. As in France gardens are well-tended, but where French gardens have a touch of careless rapture, Dutch gardens are generally clipped and mown within an inch. Hydrangeas are big, in two senses, ubiquitous and huge, whole banks of plants canal-side, in colours from white through deep pink to blue and mauve. Also as in France, all towns have hanging baskets and planters on all pillars and posts. 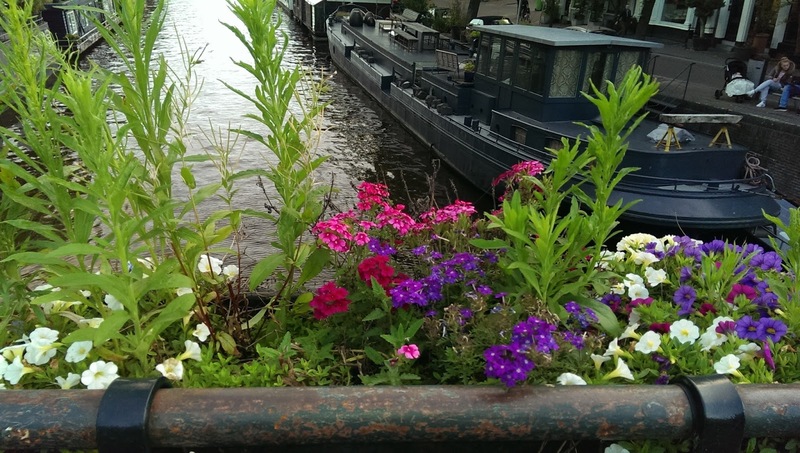 Petunias are the municipal planting of choice, sometimes interspersed with geraniums. 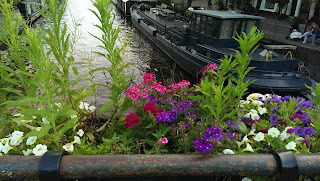 Whole towns are colour keyed, in Weesp the petunias were purple and white, in Amsterdam pink and white, in Utrecht all shades of pink. As in France, Dutch architecture is consistent - new houses echo the shapes of the past, stepped gables and steep roofs. Privacy is clearly unimportant, houses fronting right on the street generally have no blinds or curtains, and you can see through the immaculately clean windows into their living rooms, often right through open plan rooms to a well-kept garden at the back. Houses built on floating platforms on the canals were equally open to view as we motored past. The French are mostly slim, the Dutch are lean and tanned (must be all that cycling). Older women are grey-haired, not dyed. You get a strong impression of organisation and efficiency. We found people extremely friendly and helpful. Language difficulties minimal as nearly everyone speaks English. The young are fluent and almost without an accent. We do find ourselves using sign language with a very sweet lady in her 80s, as we sat in a cafe in Monnickendam. She is joined by a slightly younger male friend and her granddaughter is waitressing, and they both help us out by translating. The friend slips away and returns with a little box containing Delft salt and pepper shakers in the shape of windmills, complete with moving sails. We buy a small pack of chocolates for grandma in return, and by the time we finish our coffee and appeltaart (to which Peter has become addicted), we are practically part of the family and I get a kiss on both cheeks from grandma as we say goodbye. We really enjoyed Holland. Peter is not sure he would choose to go on the canals again as the amount of traffic and the frequent bridges mean that you need to be constantly alert while in motion, so not as relaxing as our previous French trips. For the full photo album, with more boats, birds, bicycles and a spectacular sunset, click here.